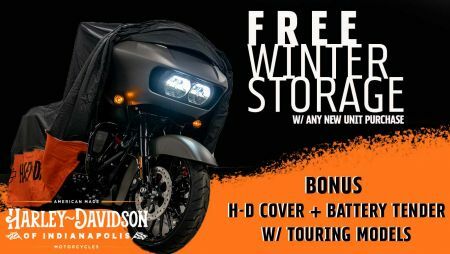 For a Limited time only, H-D® of Indy is offering Free Winter Storage with any new unit purchase. As a Bonus! We are throwing in a free Harley-Davidson® Motorcycle Cover and a Battery Tender with New Touring Model Purchases. Valid on new or untitled 2018, 2019 Harley-Davidson® Motorcycles. Some limitations may apply, see store for complete details.